Autumn colours have been late arriving this season. I’ve just returned from running a painting course in Snowdonia, hoping for a blaze of colour, but sadly only a few trees co-operated. Despite the strong winds a lot of leaves remain on the trees and it is still worth getting out and seeking colourful subjects out there. This is a small demonstration piece I did for the group. 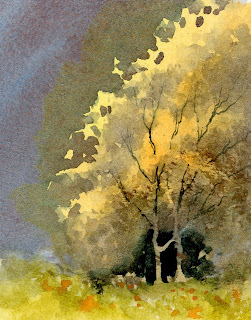 While I use a number of warm colours for autumn trees, here I’ve applied gamboge, a lovely warm yellow, with cadmium orange. To make your autumn colours really sing you need to juxtapose them against a mauve or blue-grey, as these are complementary colours. You will see this phenomenon at its best where autumn trees stand against distant hills or mountains, or against a dark sky as in the painting. There are some good examples of this in my Mountains & Moorlands in Watercolour book, and the DVD of the same name. There is a special offer on this package, which is only available on my website. This entry was posted in David Bellamy, watercolour sketch and tagged exhibition, negative painting, sketching by David Bellamy. Bookmark the permalink.